Have you considered reaching out to social influencers to win more credibility and sales? 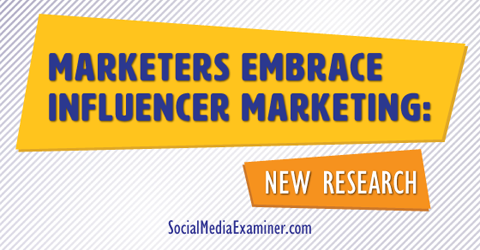 Do you want research to help make the case that influencer marketing works? In this article you’ll discover the most recent findings about marketers’ perception of influencer marketing and its ability to boost social media marketing efforts. Quickly, influencer marketing happens when marketers create a list of influencers: regular people—not movie stars—who have blogged, videoed and podcasted themselves into social media stardom. These influencers have proven credibility among and even sales to a specific target audience. Examples include fashionista Chiara Feragni (3 million Twitter followers), YouTube makeup video blogger Michelle Phan (7,600,000 subscribers) and John Lee Dumas of the Entrepreneur on Fire Podcast (923,000 unique listens in December 2014). While these stars have grown so big they actually have sponsors (advertisers who pay to put ads on their content), they also act as influencers for others in their industries. When Chiara Feragni reviews a shoe or accessory, she’s looking to provide information her audience wants. The product brand doesn’t pay for her comments. These days, influencer marketing is connected to social media stars as the influencers. In a poll of 125 marketers conducted by online promotions firm Tomoson and reported in AdWeek, marketers rated influencer marketing as the fastest-growing online customer acquisition tactic, beating organic search, paid search and email marketing. According to Tomoson, influencer marketing dethrones organic search as marketers’ best method to acquire new customers, 22% to 17%. The same study reports 59% of marketers plan to increase their influencer marketing budget over the next 12 months. The majority of marketers polled plan to increase budget allotted to influencer marketing. The buzz around influencer marketing is intensifying, but more robust studies about its effectiveness and appeal are needed. Who do you think has more influence with teens: Seth Rogan or PewDiePie? Never heard of PewDiePie? He’s the king of video-gaming content, with 34 million subscribers and over a billion total views. Not bad for someone in his early twenties who simply films himself as he plays video games. Variety magazine found PewDiePie comes out on top, beating comedic actor and writer Seth Rogan by eight spots. It conducted a study measuring 1,500 teens’ perceptions of social and Hollywood stars’ approachability, authenticity and a wider range of characteristics considered to have the highest correlation to purchase influence. Six of the top 10 highest scorers were YouTube stars, not Seth Rogan or other glitterati. Variety’s top 20 most influential stars may surprise you. The stars circled in red are from YouTube. Report: Constant Content polled 1,350 13- to 24-year-olds and found that 62% would try brands recommended by a YouTube celebrity. Just 49% would act on a Hollywood’s star’s recommendation. It’s interesting to examine just why a less-successful social media star could have more purchase influencing power than a highly successful and very wealthy Hollywood star. YouTubers are described as: just like me, understands me, someone I trust, has the best advice, doesn’t try to be perfect, genuine. Movie stars are cherished for their other-worldly beauty and features that seem superior to the average person’s. This change in perception could be a dramatic paradigm shift. Younger consumers clearly operate from values different from their parents’ when they choose whom to trust. Where older populations put more faith in success and glamour, clearly their children perceive those with less money and maybe even more scruff as more genuine and honest. Currently, most of the U.S. population with money to spend still seems to trust Hollywood celebrities’ pitches. Those under 24, however, are opening up a whole new path to stardom for those who prefer to perform via YouTube channels in unique fashion. It’s no wonder that social media stars are taking center stage when it comes to brand pitching. Younger audiences are on their computers and devices more than the family room television or the movie theater. Electronic devices just fit better into their on-the-go lifestyle. As they complete their homework, they take a break with a quick show on Netflix. Stuck in the car, they see what their friends are doing on Instagram, Snapchat and Facebook. Social influence marketing platform Crowdtap, along with marketing research firm Ipsos Media, found in their study titled Social Influence: Marketing’s New Frontier that those ages 12 to 32 spend 30% of daily media time consuming “user-generated” or “peer-to-peer” content. In comparison, they spend 13% of total media time watching live television and 10% watching shows they recorded. 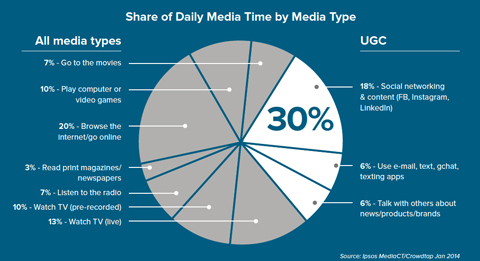 People aged 12 to 32 spend a third of their media consumption time on user-generated content. Brands looking for consumers to trust their marketing can no longer rely on traditional media to communicate their messages to consumers. In today’s landscape, it’s peer-created content or consumer-to-consumer marketing that drives trust. DEFY Media’s study came to similar conclusions, although they measured in a different way. They found 96% of 13- to 24-year-olds view online content through social media channels or YouTube at a rate of 11 hours weekly. Eighty-one percent watched 8 hours weekly of scheduled television and 56% watched recorded television for an average of 7.5 hours. The consumption of content through social media channels has given rise to the social media star. 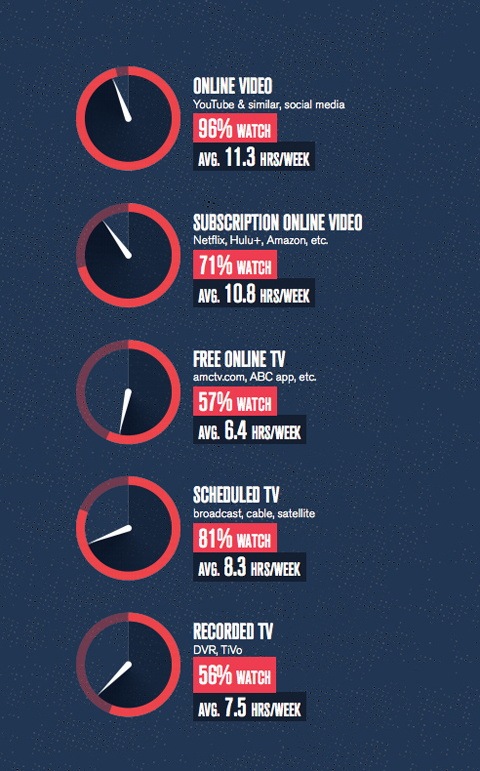 Nearly every 13- to 24-year-old watches online video content every week. Authors of DEFY Media’s Constant Content study also analyzed participants as they scrolled through their social media feeds. They tallied the type of content participants stopped on and what they scrolled by. Authors called the content that participants stopped for and consumed “thumbstopping” events. In the end, they found that those ages 13 to 24 stopped the most on content with funny messages that conveyed that they didn’t have to grow up. These were termed rebellious messages. Participants also stopped often on reflective messages, which normalized common events and helped the participant feel they weren’t alone in their emotions and experiences. This age group has become accustomed to finding these two types of content through social media and will gravitate toward brands that can provide it. Economists forecast that these young consumers will have record-breaking spending power of $1.4 trillion by 2020. Brands looking to sell in the coming years may want to make influencer marketing plans now. 20th Century Fox used influencer agency Speakr to appeal to teen boys to promote their summer 2014 film Fault in Our Stars. While executives knew the film would appeal to teen girls, they feared it would get categorized as a “chick flick,” and therefore might miss the date crowd. Speakr contracted with several male influencers including former Nickelodeon star Josh Peck of the tween hit Drake and Josh.